so if you apply a lot of side-to-side pressure on these in your bungee-jumping harness you'll be meeting the pavement up close and personal. All prices include USA shipping, and that includes you folks in AK and HI. How 'bout that? All of these are sold in packs of 50. Just scroll down to find the style you want. Can't find it on this page? That means we're SOLD OUT -sorry! These rings have black smudges on them here and there. Brass plated steel heavy duty d-rings sized for one inch straps/belts. 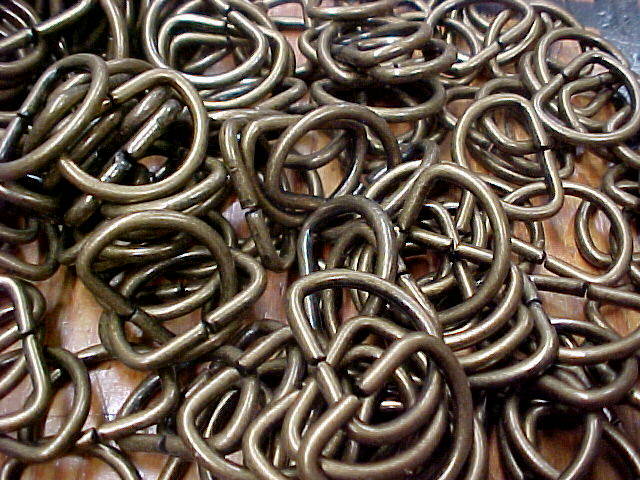 Good quality, welded eye rings are sold in packs of 10. Pack of 10 $6.00, or get 100 of these for $50, USA shipping included. Pack of 50 $16.00, USA shipping included. Pack of 10 $10.00, USA shipping included.